To participate, simply login from https://contestdream.com/contests/80 and click “Play”. with a total for the entire contest of 100.000 ENK! 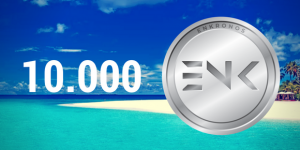 You can try your luck to win 100.000 ENK till next 8 June! Good luck and remember to whiteliste to participate our Private Sale from https://ico.enkronos.com/whitelist/.